I thought I’d take a moment to snap and share some pictures of the Science Tricorder Mark 5 prototype in its mid-development state. I’ve recently hit a snag with the WiFi, and have a little downtime while I’m waiting for a reply to a support e-mail. The form factor of the Mark 5 looks much like a smart phone. In fact, it happens to be about the same size as my blackberry, though ultimately it’ll be a little thicker to accommodate the size of some of the larger sensors, like the distance sensor, open mini spectrometer, and a few others. Ultimately I think this form factor is adds a lot in terms of usability over than the folded design — with the Mark 1 and 2 you’d often have to hold the device at an odd angle, with the angle for trying to scan something usually being much different than the angle to see the screen. Here, I’ve moved many of the omnidirectional sensors (that happen to be thin) to the top of the device, and placed the directional sensors (which also tend to be much larger) on the bottom — the idea being that you could make use of the omnidirectional sensors in any position, and use the directional sensors much like you’d take a picture with your smart phone. This also effectively doubles the amount of exterior-facing sensor space, which is fantastic. Keeping things tractable is one of my central design philosophies, otherwise most of this wouldn’t be possible. This was a lesson that I learned very well with the Mark 2 — designing your own ARM-based motherboard is a lot of fun and you learn a great deal, but it’s also time consuming (even with reference designs), and as a one-person project you have to pick your battles. So in this respect, choosing the computational bits of the Mark 5 was one of the most challenging choices in that it has to balance capability, ease of modification, and implementation time. In terms of capability, it’s important that the Mark 5 have advanced visualization capabilities like the Mark 2, and WiFi capability both to move data out of the device, as well as (eventually) upload the data to a website that would allow folks to share their sensing data. In terms of ease of modification, I’d like folks to be able to modify and reprogram the device as easily as possible, and use it as a vehicle to explore electronics, science, and math as much as to visualize the world. In addition to all this, there are a bunch of pragmatic concerns — power consumption, development tools, product end-of-life, and so forth. This was a very difficult choice to make, and given that there’s no perfect option, I bounced back and forth quite a bit. On one hand I thought about moving to something Arduino or Chipkit compatible, that would be very easy to program, and fast to develop, but which would sacrifice computational capability. 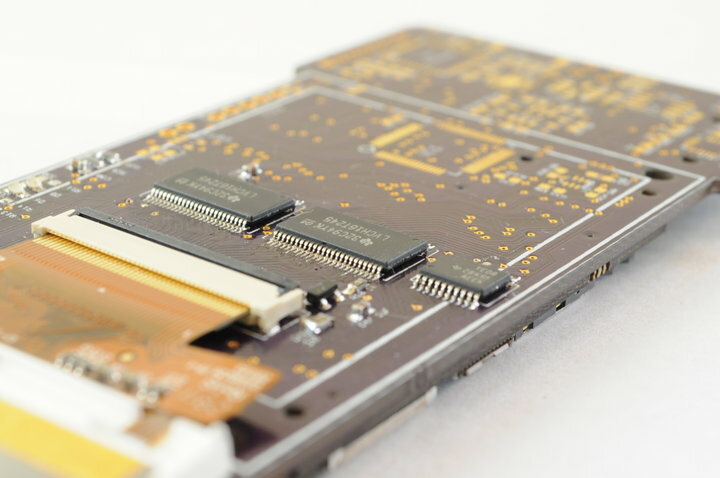 On the other hand, ARM-based surface-on-a-chips would have computational capability, and could run a piece of middleware that would make it easy for folks new to programming to modify, but the development time and development cost would be very high. The Mark 5 would likely have to move to a 4-layer or 6-layer design, which would add a barrier to folks in the open hardware community who might want to contribute, or make derivatives. In the end, I went back to an idea that I’d considered for the Mark 2, which is to use a small system-on-a-module that contains the time consuming bits — processor, memory, wifi, etc. 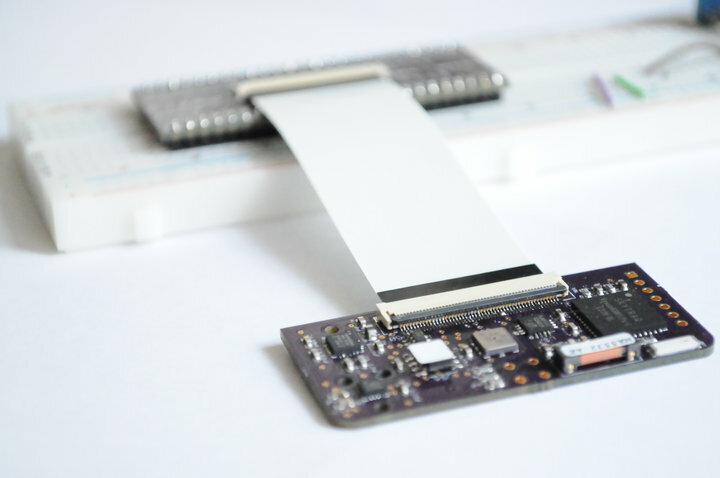 — and be able to focus my attention on the project-specific bits like the sensors. There are currently not a lot of options for an extremely small system-on-a-module that includes WiFi. For the Mark 2 I had considered using a Verdex by Gumstix, and for the Mark 5 I settled on trying their Overo FireSTORM modules, which include a TI OMAP3730 processor running at 800mhz, 512meg of RAM, 512meg of flash, and onboard wifi and bluetooth. The modules are also very, very small, and run Linux. After weeks of tinkering I’m still having issues connecting to the WiFi (it’s been very spotty for me, only worked a few times, and most of the time doesn’t detect the WiFi hardware), and while it’s not clear whether it’s a hardware or software issue, from the Overo mailing list it appears as though this is an issue a bunch of other folks have run into. I sent off an e-mail to the Gumstix folks early last week, and hopefully I’ll hear back from them soon with some help. Hopefully after that’s sorted out I can work on the display driver, and start populating the sensors. 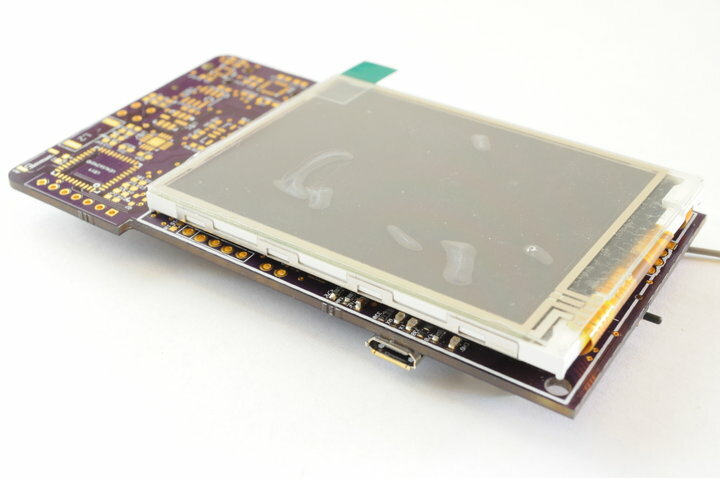 In addition to the touch display and a bunch of level translators, the top of the board contains an ultra low power PIC microcontroller to act as an interface between the sensors and the Gumstix, much as in the Mark 2. Because I’m still tinkering with the Gumstix, I haven’t yet populated many of the sensors on the Mark 5 so that I can better diagnose any issues that come up. To help prototype the Mark 5’s sensor suite, and also for when I was considering making an Arduino-powered Mark 5, I designed a breakout board that’s essentially just the upper sensor section of the Mark 5. Here only the top sensors are populated, including the magnetometer, inertial measurement unit (consisting of a 3-axis gyro, accelerometer, and internal magnetometer), ambient humidity sensor, ambient temperature and pressure sensor, lightning sensor, and the GPS. Both the lightning sensor and GPS have RF components, which I don’t have a lot of experience with, so it was very comforting to see the GPS acquire a lock and display position information accurate to within a few meters. Interested readers may also notice the footprint for the open mini spectrometer on the left side of the board. 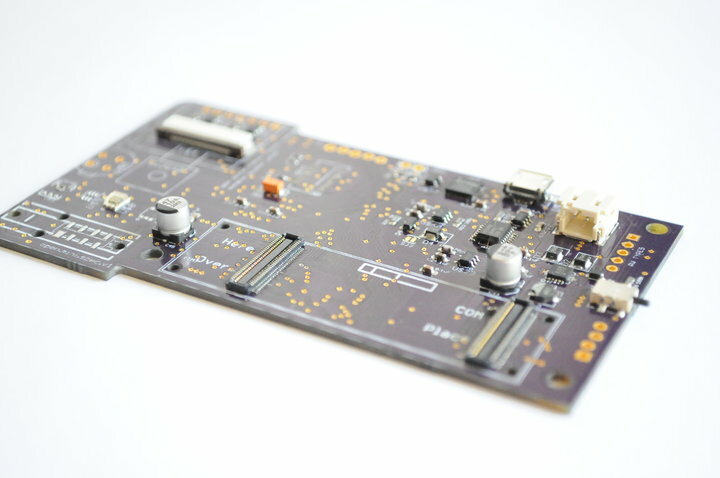 The bottom side of the board, not populated or shown here, contains the spectrograph for the open mini spectrometer, camera, distance sensor, low resolution thermal camera, colour sensor, as well as a prototype for a 3D printable linear polarimeter much like the one on the Mark 1. The Mark 5 board itself includes footprints for both a radiation sensor and a gas sensor that didn’t fit on this breakout board. I thought I’d include a few assembly pictures. 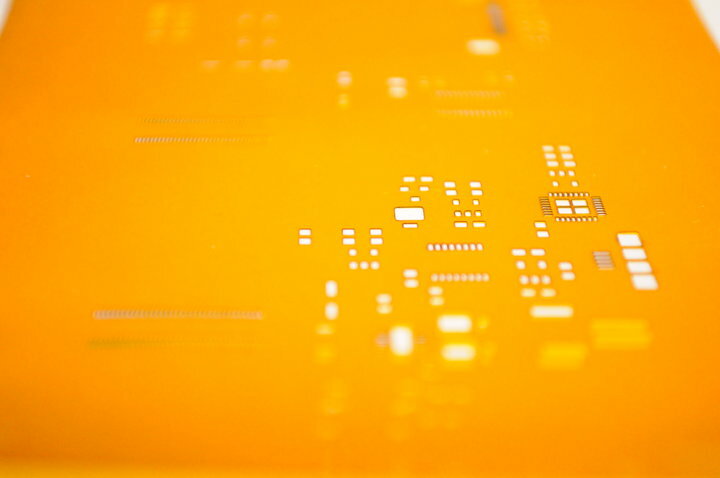 Here’s one of the solder paste stencils, for the bottom of the board. Among pictures that I’ve taken recently, it’s also one of my favorites. 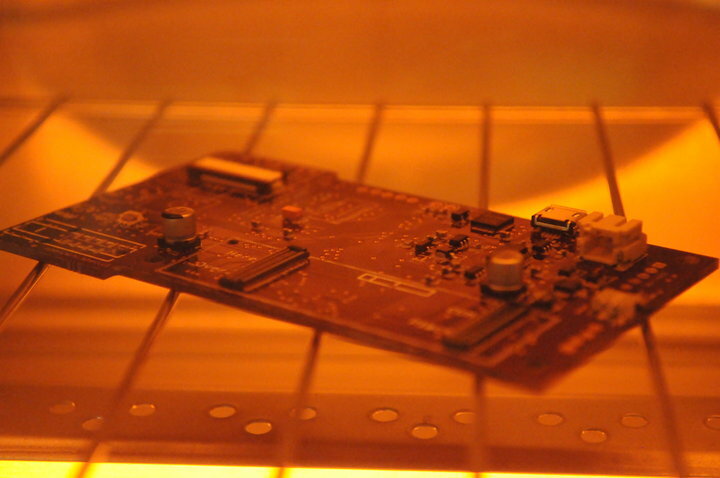 Here, after the solder paste was applied and parts placed, the bottom components are being soldered in a make-shift reflow oven. Fresh from the oven and after cleaning a few solder bridges, the first prototype Science Tricorder Mark 5 board is ready to begin the development process. I have to say, that this blog has inspired me to go back to school for Computer Engineering. I’ve been in the IT field for years, and am a huge Star Trek fan. However, seeing something like this comes to fruition makes me want to pursue my original goal of being an Engineer to help bring some the of great technologies of Star Trek into reality.